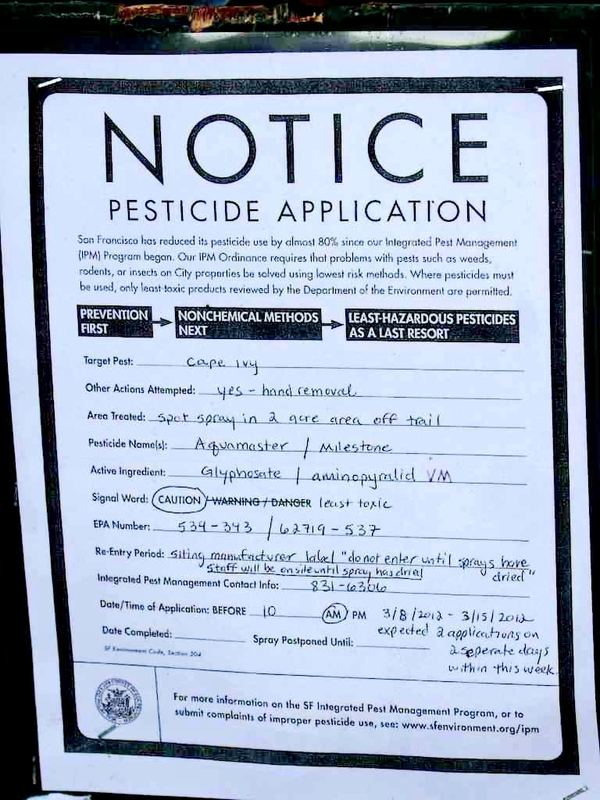 Glyphosate application, Glen Park, San Francisco. The use of the herbicide, glyphosate (AKA Roundup) has skyrocketed since genetically modified seeds were introduced which enable farmers to spray their crops with unlimited amounts of glyphosate without damaging their crops. We have been reading with increasing alarm the mounting evidence of the damage that is being done to the environment by this indiscriminate use of glyphosate as well as evidence of the impact on human health. We’ve been holding out for an unimpeachable source to inform our readers of this evidence because our critics often accuse us of being alarmist. Farmers who do not use herbicides report that their crop is often damaged by aerial drift and water runoff from their neighbors who use herbicides. “Superweeds” that are resistant to any herbicide are becoming more numerous. Million Trees reported on this issue recently. The reaction of the Environmental Protection Agency to these superweeds was to increase the amount of glyphosate that can be legally used on agricultural crops. This is a very unfortunate response to the problem in our opinion and will surely prove to be self-defeating in the end. The herbicide binds with minerals in the soil—manganese, calcium, boron, etc.—to reduce run off. The herbicide is competing with the plant for these minerals which the plant needs for its growth. These minerals are also important to human nutrition. If the plant contains fewer minerals, its nutritional value is reduced. This binding of the minerals in the soil is changing the physical quality of the soil, making it very hard and difficult to cultivate. Farmers report that plowing their fields sprayed with glyphosate has become increasingly difficult. If the roots of the plant can’t penetrate the soil, the growth of the plant is retarded. 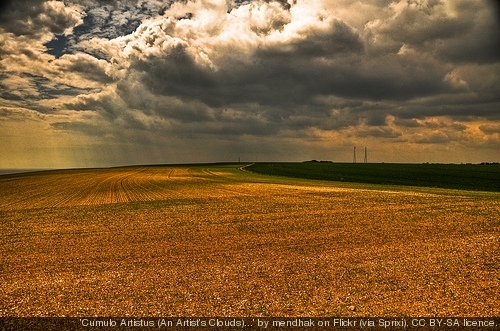 The herbicide is killing fungi and microbes in the soil. These plants and creatures also benefit crop plant growth by facilitating the transfer of nutrients from the soil to the crop plant. Another study reports that glyphosate residues in the food we eat are also interfering with the operation of the microbes in our bodies. Many of these microbes are beneficial to us, especially essential to our digestion. If you have had a course of antibiotics, you may have had the opportunity to experience the discomfort of losing beneficial microbes in your gut. Antibiotics often kill both the bacteria that make us sick and the microbes that are essential to your digestive health. Most of the genetically modified crops are corn and soy. These crops are widely used as animal feed. We speculate that if these crops are harmful to humans, they are probably also harmful to animals. The manufacturer of glyphosate, Monsanto, has refuted these observations. You can read the New York Times article if you are interested in their version of the story. We close with the words of a farmer who tried Monsanto’s genetically modified seeds. After several years of spraying his crop with glyphosate he has returned to conventional seeds and he is no longer spraying glyphosate: “Although a neighbor told him that he would go broke growing conventional crops, Mr. Verhoef has no plans to go back to genetically engineered varieties. ‘So far so good,’ Mr. Verhoef said, ‘I’m not turning back, because I haven’t seen anything that is going to change my mind about glyphosate.’” We consider this farmer a more credible source of information than Monsanto. It is funny but Roundup has been getting a lot of press lately. There is not much “good news” on it outside of what the manufacturer reports. It is an alarming subject, just ask any bee keeper. I don’t use it on the garden ever (although my client’s gardeners do of which I have no control outside of cautioning them) , but I have used it on interlocking pavers for weed control. The soil reports give me pause to say the least. You are very right that there is indiscriminate use, but to get people to see the consequence of actions in the long term is difficult. People want immediate and this product gives it to them. Thank you for posting this. I will check out the NY Times article too. Webmaster: You are absoluately right that the fact that the consequences of pesticide use are long-term is the biggest obstacle to convincing the public to take the issue seriously. If people were dropping dead immediately after their use, we could ban them in a minute. Indeed, all evidence suggests that we are damaging ourselves with these pesticides, but by the time that damage is visible, we can’t connect the damage to the pesticides except with circumstantial evidence. For example, gardeners at golf courses where pesticide use is extremely high, are dying of cancer at rates far beyond the general population. I’ll never forget seeing a California Newt dying a horrible death after crawling through a roadside sprayed area. The man in charge of the agency who continues the spraying pretended such things never happened. There is no excuse ever to spray poison. Ever.